The overall incidence of bulbomembranous urethral stricture or bladder neck contracture after radiation therapy is roughly 3–16 %. Time to stricture presentation is usually delayed (24 months) and insidious. Radiation urethral strictures typically have an unhealthy or pale appearance on cystoscopy, with varying degrees of local tissue induration or dense fibrotic scarring. Radiation-induced urethral strictures are often refractory to urethrotomy or dilation and merely palliative and require successive treatments. 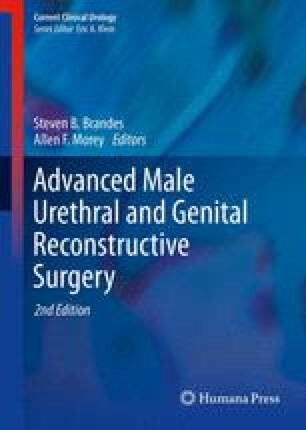 Management methods include intermittent self-catheterization, off-label use of an endourethral prosthesis, excision and primary urethral anastomosis urethroplasty, onlay flap and graft urethroplasty, salvage prostatectomy with anastomotic urethrovesical urethroplasty, combined abdominoperineal urethroplasty, onlay flap urethroplasty, and supravesical urinary diversion surgery. Urethroplasty seems to be feasible and reasonably successful for RT strictures in the short term, with the best results with anastomotic urethroplasty.